Jimmy Vicaut - First 7 Steps is the Secret to sub-10? 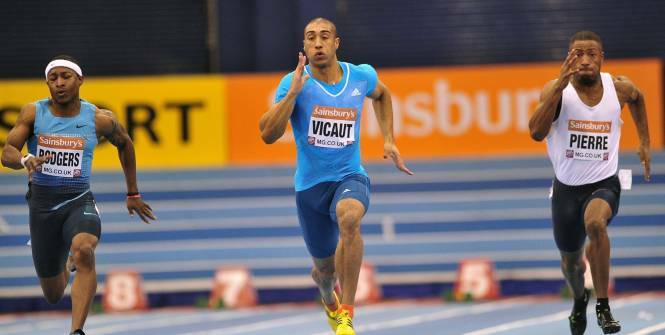 Jimmy Vicaut – First 7 Steps is the Secret to sub-10? The first cut is the deepest, and the first 7 steps are the secret. 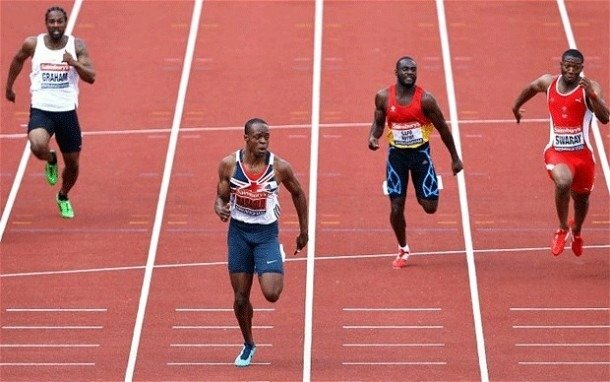 In the 100 meter sprint, why are elite sub-10 sprinters taking 7 Strides for the first 10 meters? Reprise des départs très prochainement à l’entraînement… Même si les progrès sont là, il reste encore beaucoup de travail. Is 7 strides to 10 meters the secret to sub 10? Thanks to the USATF’s Andy Ferrara, I analyzed some high speed videos of Beijing’s 2008 Olympic 100 meter final. I don’t need to do the rest of the math as we all know the outcome. 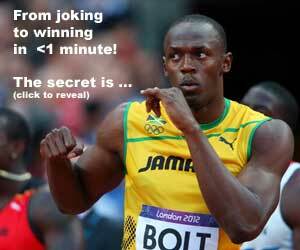 Sure, Bolt is taking LONGER to reach a fixed number of strides (i.e. first 10 strides = 2.62 seconds compared to Thompson at 2.50 seconds! ), but last time I checked, they gave gold medals for the fastest time over 100m, not 10 strides, or 41 strides for that matter. Somehow, the sweet spot (or PB or WR) lies somewhere in between your stride rate and stride frequency. Coupled that with tremendous power on the ground while you have ground contact. There’s nothing you can do while in the air unless you have wings. With the emergence of Bolt, we have a new group of people advocating the longer stride theory again. Take a look at Carl Lewis or Mike Marsh videos from the 1980s and 1990’s and you can see the long stride theory made everyone rethink their mechanics. Then Andre Cason showed how a fast cadence with shorter strides could do the trick. When Maurice Green dominated the sprints, he (and John Smith) had us believing it was all in the cadence. Even today, Walter Dix took 48 strides! Chambers, who says that “attention to detail” in coaching has been the key to Jamaica becoming the sprint capital of the world, is confident of beating Bolt in 2009. So now we are back where it all began with the longer stride theory. To me, it’s a correct assumption, IF the longer stride is a result of greater leg and hip strength and power. Plus running relaxed, of course! 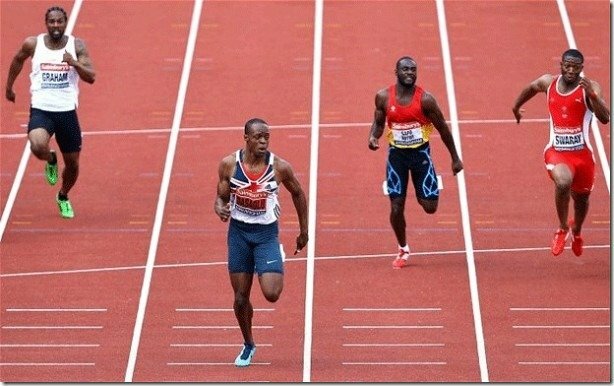 If you want to sprint fast, then you might as well imitate the experts, at least to a certain degree. Before you can reach a certain speed, you have the the pre-requisites of strength, explosive strength and Elastic/Reactive strength first! You can look up Al Vermeil’s Hierarchy of Athletic Development and see what I mean. For Elastic/Reactive strength, see Driving Resistance Band Training with a video from Remi Korchemny. You can, however, easily bound for 7 steps to 10 steps, but that will take too much time. You are trying to cover ground as fast as possible. Bring Back the Wicket Drills? I remember my interview with Lance Brauman, who talked about the importance of wicket drills. There was even Vince Anderson who used the acceleration ladder, to the point where he uses his chart more often than a stopwatch. What does that tell you about the importance of the first 7 steps? When you leave the blocks, keep the heel low until the shin is about 45° to the ground. Then drive the foot down landing on the ground just behind the body’s center of mass (COM). In the next 7 strides, the angle of shin of the front leg will increase by 6 or 7° per stride so that by 10 meters (or 7 strides) the shin is vertical to the ground. Your body shouldn’t be completely vertical at this point (i.e. not standing up, though most Masters and Youth athletes do this, and even myself on a bad day), but there is a still a noticeable forward lean. Note the body angle increases from about 45° from leaving the blocks to about 30° degrees or less… so that’s about 2° per step moving forward. At the 10 meter mark, you should be about 70-75% of your max velocity, and by 30 meters, you’ll be at 90% maxV or more. When you train short to long, you do Acceleration Development in September or October. These little things matter today. So as far as speed work goes, we work on acceleration development all year long, and I usually look at the first 10 meters or 7 steps to analyze and dissect where I can improve. But how about the first 2 steps? With todays high-definition cameras and video analysis software, we can do things today that didn’t exist 20 years ago. If you are following the 100m, you probably remember James Dasaolu’s recent 9.91 (+1.1) from 2013.